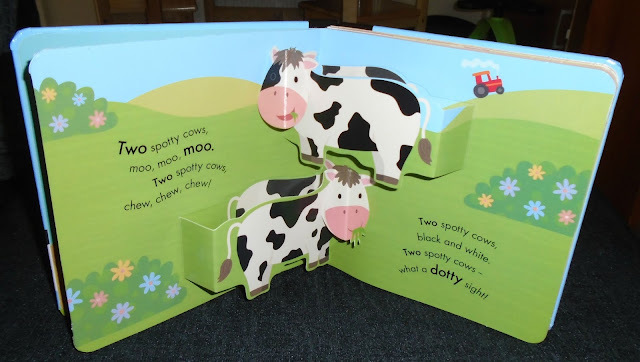 We own several books from Little Tiger press and the My Little World series but I have to say this pop up book is one of our favourites! The books features the classic My Little World bright, bold and colourful pictures that really manage to capture a young child's attention and imagination. However this books features something even more... pop up features! 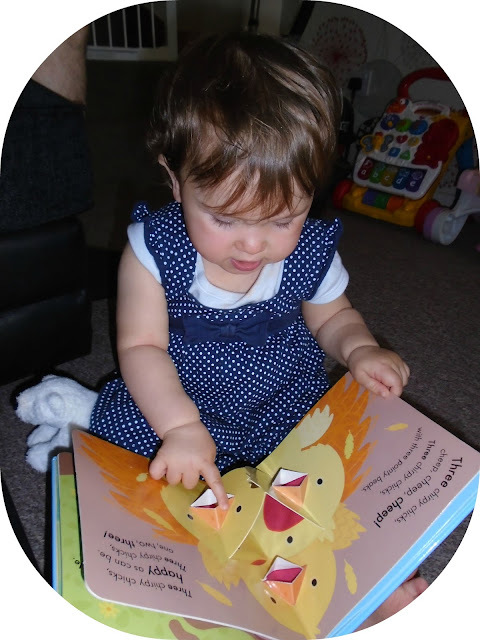 Evelyn is still to young to read but I love reading to her and she really seemed to enjoy this book as it was a little interactive for her rather than just listening, with each page she eagerly awaited me to turn it and for the animals to "pop" out of the book (she let out a little chuckle every time!). The book definitely can withstand some degree of manhandling from children as Evelyn tugged at the paged and poked at the pop-up sections but they are all still perfectly in tact. 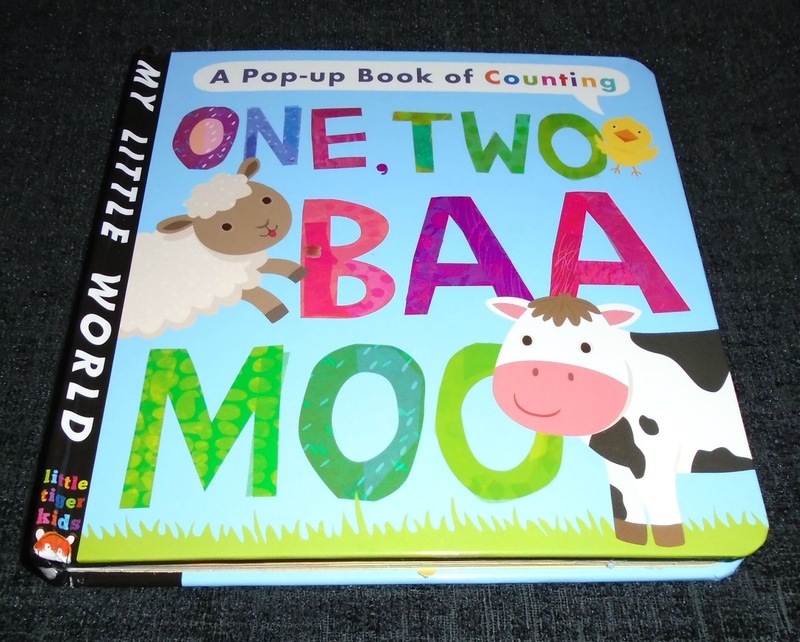 One, Two, Baa, Moo is aimed at children aged 3-5 years although as I mentioned above Evelyn is only 14 months old but loved having this book read to her and thoroughly enjoyed the pop-up features. There are 2 books in this pop up series the other is called "Red car Blue Car" and both are priced at £6.99. I love that these books are hard wearing and sturdy featuring an extra thick hardback front and back cover and large chunky pages, even the card used for the pop-up features seems quite thick and sturdy. For slightly older children this is a great book to introduce children to reading simple words, numeracy and identifying different animals and it also features a lovely rhyme throughout the book making the short story flow. 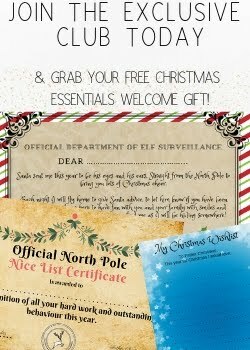 If you want to find out more about any of the My Little World series pop over to the Little Tiger Press website here - www.littletigerpress.com. You can also stay up to date with all the new Little Tiger Press news and new releases via their Facebook page HERE.